I am participating in Picture Books 14:14, a challenge created by Christie of Write Wild that encourages bloggers to review 14 picture books in 14 days, starting on Feb. 14th. I am also including this post for Poetry Friday, which this week is being hosted by Heidi at My Juicy Little Universe. 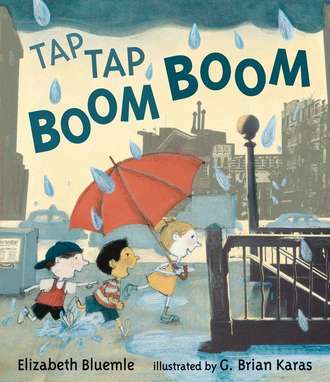 Tap Tap Boom Boom is based on the author's own experience with an urban rain storm. 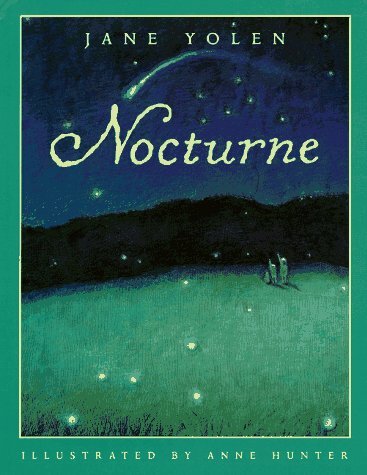 This delightful story reads much like a spoken word piece and is a book that begs to be read aloud, likely again and again. 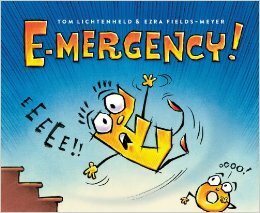 This book is a Charlotte Zolotow Honor Book this year. You can read about the other Zolotow winners here. 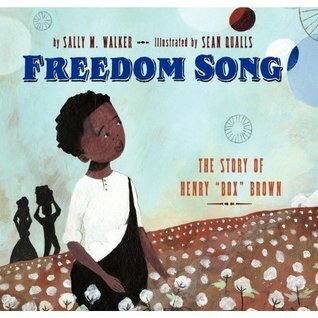 Again, like with Nocturne last week, I have chosen to highlight a picture book for rhyme that is really more about the rhythm than a strict rhyme scheme. The sharp staccato of mainly two-word lines mimics the pattern of the arriving, crashing, and departing storm, while the repetition of the title phrase creates a refrain that echoes through the story. The opening lines, shown above, give you a taste for the style of this poem. 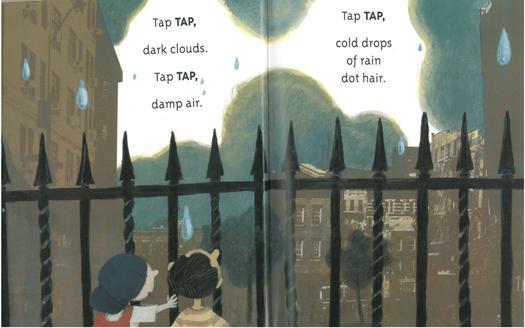 You can find typical rhymes (air/hair) but also alliteration (dark clouds/damp/cold drops/dot) and repetition (tap tap). 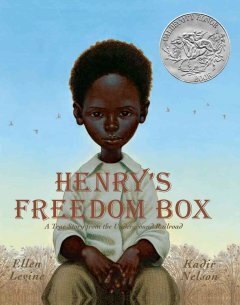 When I brought this book into my classroom, a group of boys immediately decided to read it out loud to each other. Totally unprompted, the lead reader ended up turning the book into a song. Try it yourself. See if you can resist the urge. 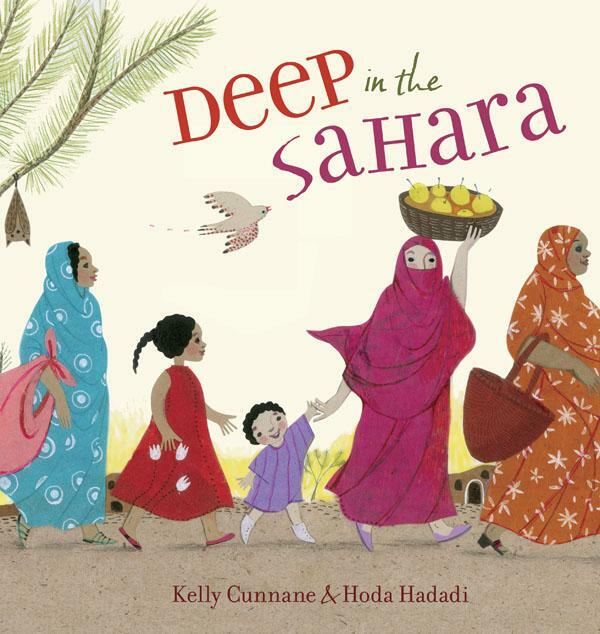 Deep in the Sahara is an immersive picture book told in second person, placing you, the reader, as young Lalla, a Muslim girl living in Mauritania in west Africa. During the course of the book, Lalla explores why she wants to wear the malafa like her mother and relatives. The language in this brief picture book is lovely and rhythmic, and the second-person point-of-view is unique and unexpected. The patterning of the language matches the patterning of the story and helps reinforce the character's journey (and ours) to understanding the malafa and all it represents. Each time, Lalla sees a different person in her malafa and expresses her wish in a lyrical way. The first one is, "More than all the stars in the sky, you want a malafa so you can be beautiful too." But then Lalla's request is rebuffed, as her mother tells her, "'Lalla, a malafa is for more than beauty.'" For each pair of two-page spreads, the verbal patterning continues. The malafa is for more than being mysterious, the malafa is for more than being like a lady, and so forth. It is only when Lalla requests a malafa so that she can pray like her mother does the pattern stop with a powerful one-line, two-page spread. "Mama stops and looks at you." Only then is Lalla's questioning and understanding rewarded. Second-person, present tense narration is tough to pull off and generally rare in literature, but I think that it works well in this book because most of us readers know as little about the malafa and its importance in west African Muslim communities than does Lalla. Through her eyes and through the patterning of the text, we all learn an important lesson. Summary: A modern day adventure as our protagonists search for Excalibur and the treasures it holds! Continuing the adventure that began in Egypt a few months prior in The Secret of the Sacred Scarab, cousins Adam and Justin Sinclair are hot on the trail of the second Stone of Power, one of seven ancient stones lost centuries ago. This stone might be embedded in the hilt of a newly discovered sword that archaeologists believe belonged to King Arthur: Excalibur. Join Justin and Adam as they search not only for the second Stone of Power, but also for the Scroll of the Ancients, a mysterious document that holds important clues to the Seven Stones of Power. As their adventure unfolds, they learn many things and face dangers that make even their perils in Egypt look tame. 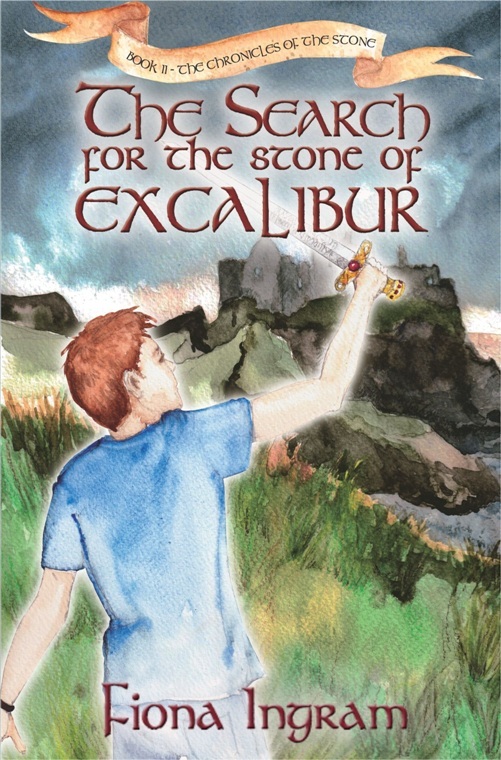 The Search for the Stone of Excalibur is a thrilling middle grade adventure/mystery novel, similar in focus and as action-packed as the 39 Clues series. Protagonists Justin and Adam are joined by new companions Kim and Ink, as they travel to Scotland to unravel the mysteries behind the second Stone of Power. The author does a good job of weaving significant background information in about King Arthur as well as archaeological and historic evidence about the man, Arthur, as distinct from the legends. This combination of ancient myths with modern resonances makes for an appealing framework for the series. The book is lengthy, but there are many different locations and mini-adventures packed within. While some of the major plot points are clearly telegraphed well in advance, they may still come as a surprise to some readers. The adult characters are all fairly one-dimensional and are clearly intended as background noise to the intrepid duo and their new pals (or occasional foils), but many kid readers are not interested in the adults in this type of book anyway. The book is listed as recommended for ages 10 and up, but I would feel comfortable recommending this book to advanced younger readers. There is no inappropriate or teen content, though there are ghost stories, attempted poisonings, kidnappings, and the like. If you are looking for an eBook for a reluctant reader or adventure-fiend, then this might be a good book for you. My biggest complaint about the book is that the eBook format makes it difficult if not impossible to have in a classroom library and the listed Amazon prices for "paperbacks" seem outrageous. 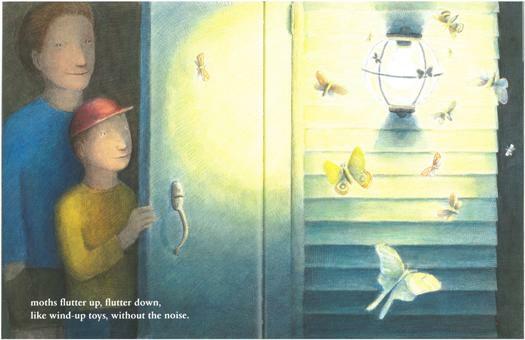 If you have not yet read I Want My Hat Back (or, its incredible follow-up, the Caldecott Award-Winning This is Not My Hat), then you are in for a treat. 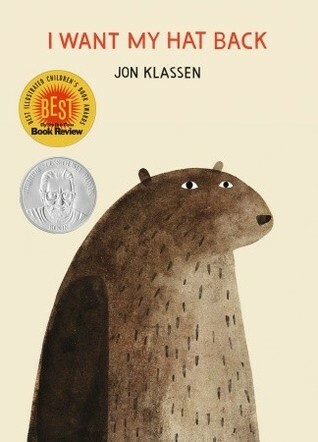 Bonus points for reading it aloud to kids too, as their reactions will make this book even more memorable. 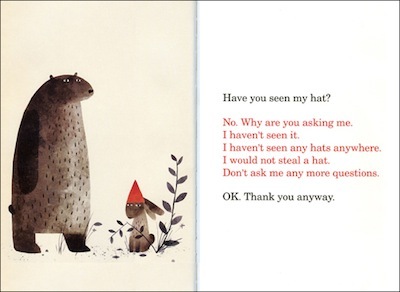 I Want My Hat Back is told entirely in dialogue, and author/illustrator Jon Klassen uses color rather than quotation marks and dialogue tags to differentiate the speakers. Our main speaker, the bear, speaks in black, and the rest of the characters he interrogates speak in red. The patterning of the book is established early on. After bear laments about the loss of his hat, he sets off to find it. The bear asks each creature he meets, "Have you seen my hat?" With the response being, "No. I haven't seen your hat." The bear politely ends each conversations with, "OK. Thank you anyway." The responses vary slightly, but the interactions are the same. Until we get to the rabbit. Wearing a jaunty red dunce-cap shaped hat on his head, the rabbit has the following response to the bear's basic question: "No. Why are you asking me. I haven't seen it. I haven't seen any hats anywhere. I would not steal a hat. Don't ask me any more questions." To which the bear responds, "OK. Thank you anyway." At this point, the alarm bells should be going off in any reader's brain, and children's reactions to this page and to the pages that follow are priceless. In the famous words of Reading Rainbow's LeVar Burton, "But you don't have to take my word for it." Read it for yourself. 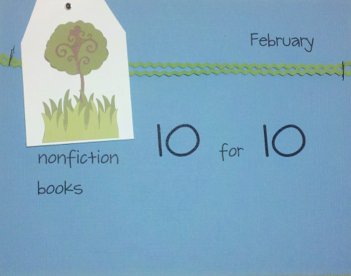 Somehow I missed figuring out when the date was for February's Nonfiction Picture Book 10 for 10 (#nf10for10) and did not realize it had come until my inbox overflowed with wonderful posts on Feb. 19th! So, alas, here is my belated addition. 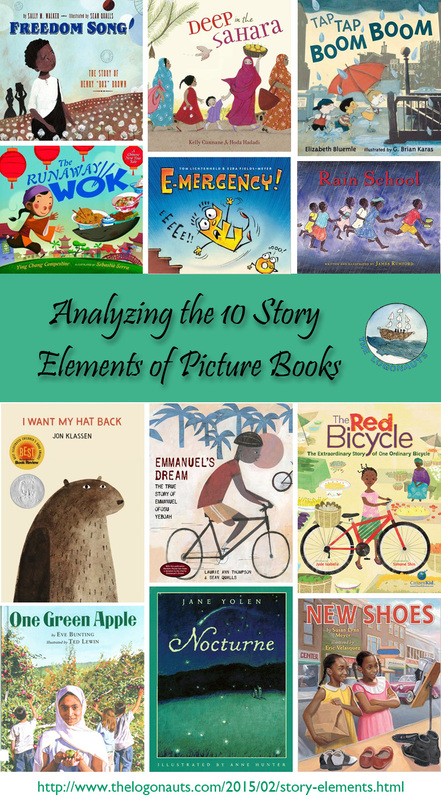 Now in its third year, Nonfiction Picture Book 10 for 10 is co-hosted by Mandy Robek of Enjoy and Embrace Learning, Julie Balen of Write at the Edge, and Cathy Mere of Reflect & Refine. This year all activity is collected on the Picture Book 10 for 10 Community. Traditional tales fall under the Dewey realm of nonfiction. 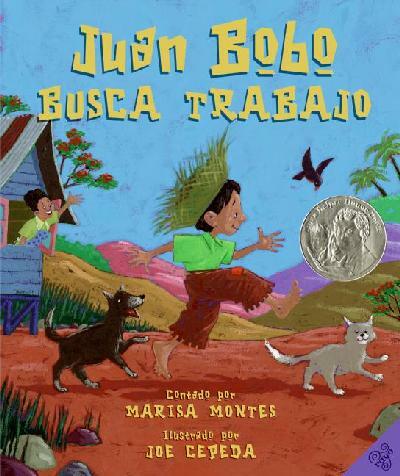 Since our third grade curriculum is based around world geography and world cultures, many of the books that I share aloud with students are folktales from different countries and cultures. 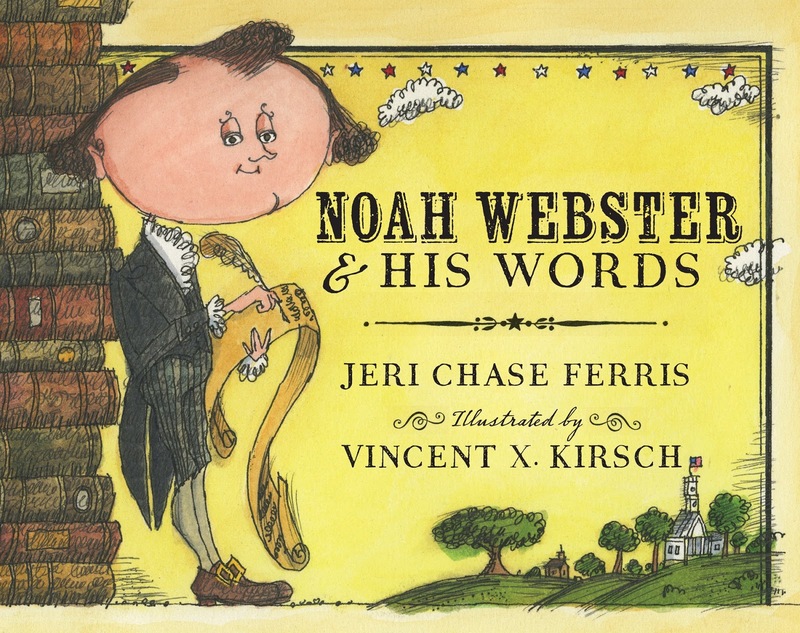 This post brings together ten of my favorites, all of which are ideal for reading aloud to kids (and most of which are quite humorous). They are listed in geographical order, based on our units of study during the year. 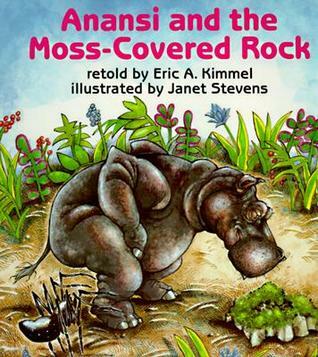 Anansi and the Moss-Covered Rock (1988) by Eric Kimmel and illustrated by Janet Stevens is probably my favorite of the Anansi the trickster stories from west Africa. Last year I turned it into a quick Reader's Theater-style play that my third graders ended up performing in front of the whole school, and it was riot. Here, Anansi discovers a strange moss-covered rock with the power to knock its viewer unconscious, and he uses it to trick a variety of animals. But little does Anansi know that he is being observed, and he ends up being tricked himself. 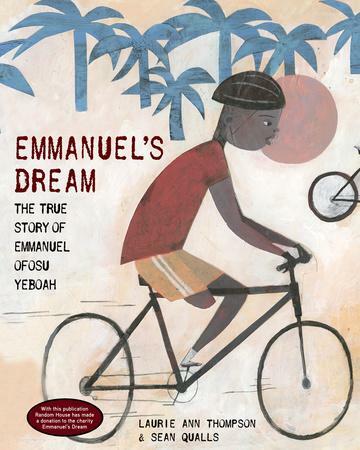 Read about all the Anansi stories by Eric Kimmel in this post. 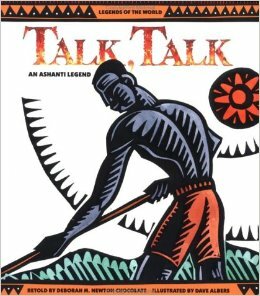 Talk, Talk: an Ashanti legend (1993) by Deborah M. Newton Chocolate come from the Ashanti people of west Africa. Everything was going along just fine for Jumaani the farmer until his much-ignored yams decide to tell him just what they think about it! From then on, all sorts of creatures and objects begin sharing their opinions, and poor Jumaani and rest don't know what to think. 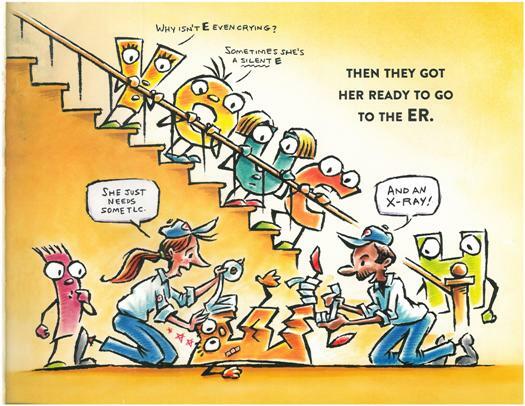 Kids love the humor of all the unexpected talking - including the surprise twist of the ending. 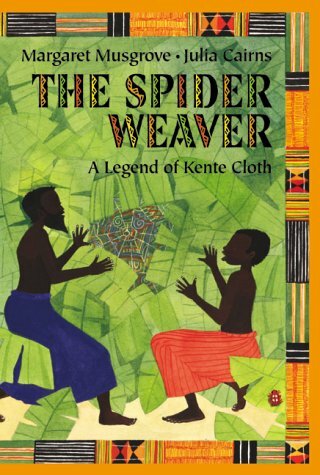 The Spider Weaver: a legend of Kente cloth (2001) by Margaret Musgrove and Julia Cairns. This picture book relates the legend of the discovery of kente cloth by two Ghanaian weavers. Students enjoy seeing how the weavers learn from the spider and how kente cloth has become what it is today. 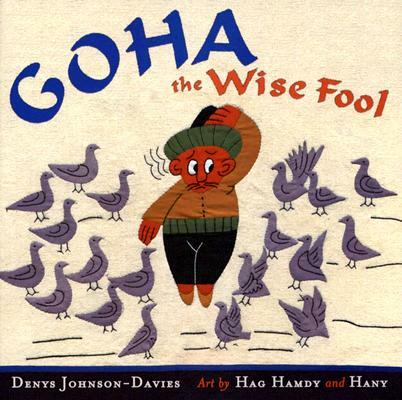 Goha the Wise Fool (2005) by Denys Johnson-Davies and illustrated by Hag Hamdy and Hany. Goha is the Egyptian name for the "foolish" folk hero of the Middle East also known as Nasreddin and many other variations. 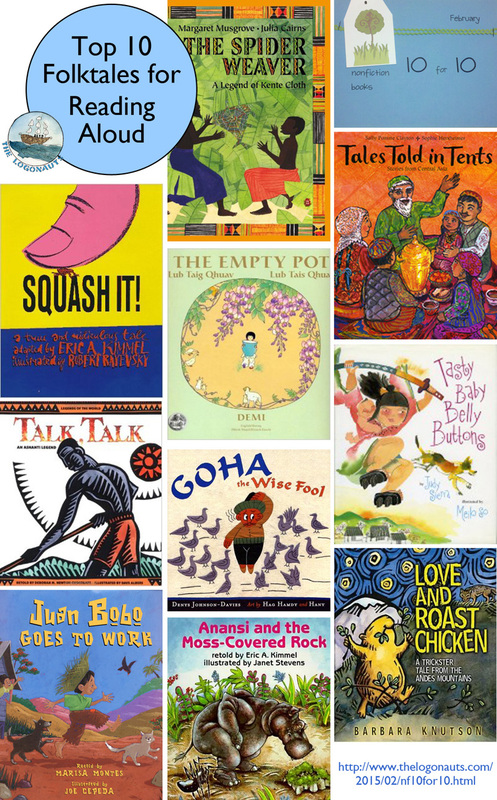 These short, pithy tellings of the stories are wonderful and will keep your students cracking up. The amazing artwork was hand-sewn by a pair of Egyptian tentmakers. 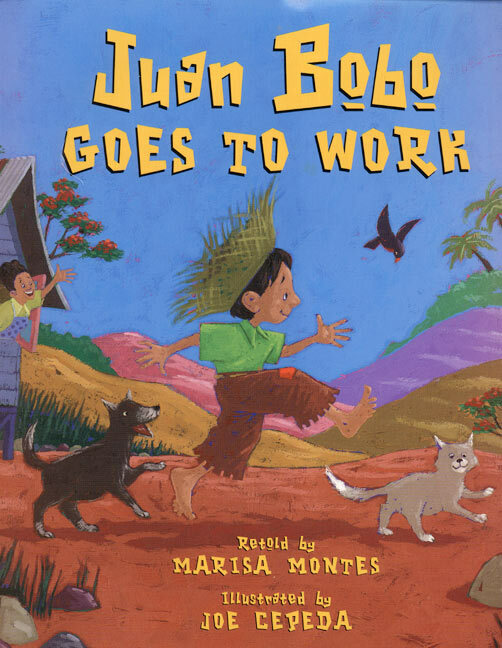 You can read more about Goha and other "foolish" wise men in this collection of tales. 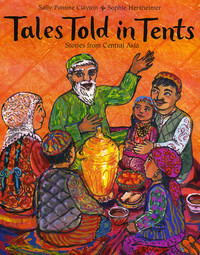 Tales Told in Tents: stories from Central Asia (2004) retold by Sally Pomme Clayton and illustrated by Sophie Herxheimer. This collection of tales includes those from Kazakhstan, Turkmenistan, Kyrgyzstan, Afghanistan, Uzbekistan, and Tajikistan. Favorites of mine include The Secret of Felt and The Bag of Trickness, featuring the well-known Central Asian trickster Alder Kose. 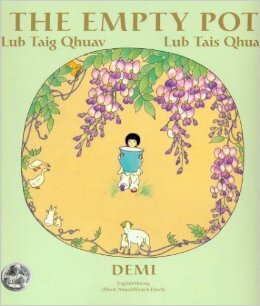 The Empty Pot (2001) by Demi. This retelling of a Chinese folktale is also available in a multilingual printing that includes two versions of the Hmong language. Young Ping is overjoyed when the emperor puts forth a challenge - the child who can grow the most beautiful plant will become his heir. This story highlights the importance of honesty and good character, and kids will be surprised by the twist at the end! Squash It! 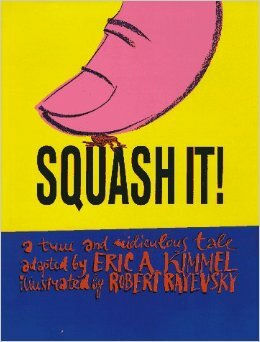 (1997) retold by Eric Kimmel and illustrated by Robert Rayevsky. This absurdist tale comes from a collection of folktales from Spain and features ... a louse. Now, a louse is not normally a welcomed guest, but in this case, when a louse has bitten the King of Spain, he must be treated with respect, for he now has royal blood. The story only continues to ramp up from there, and kids will be delighted by the unexpected twists and circular ending of this humorous tale. 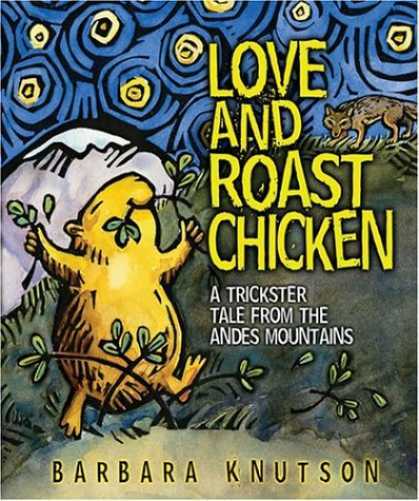 Love and Roast Chicken: a trickster tale from the Andes Mountains (2004) retold by Barbara Knutson (also available in Spanish as Amor Y Pollo Asado). 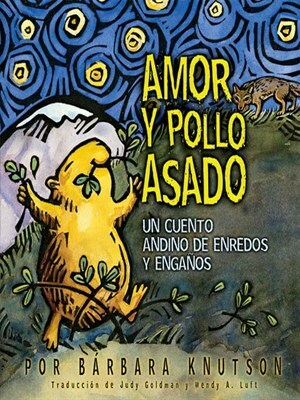 Poor cuy (guinea pig) is such a small, defenseless creature, that he must rely on his wits when he is threatened by Tio Antonio, the fox. His clever solutions to difficult situations will keep kids laughing and impressed by his creativity. 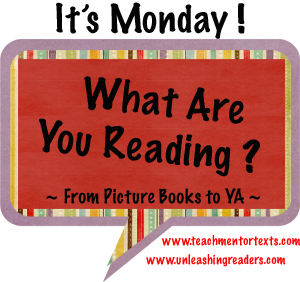 Do you have a favorite folktale for reading aloud that I have missed? Please share in the comments below!